I also worked harder on Thursday than I had on the previous days, which was evidenced by the regular fountain of sweat pouring from my face. I feel like I should come back home ten pounds lighter or so, given all of the sweating, digging and heavy lifting I’ve done so far. One of the positives on Thursday was finding a rather large potsherd, pictured below. Of course, we find hundreds (or even thousands, depending where we’re digging) of sherds in a given day, but some are recognizably more special at the outset given their size or the presence of some unique feature, like designs, or the sherd’s location on the piece of pottery. Especially interesting are pieces of the base, handle, or rim, by which it becomes easier to understand the function of the pottery, its classification, and, perhaps, its rough date of manufacture and use. 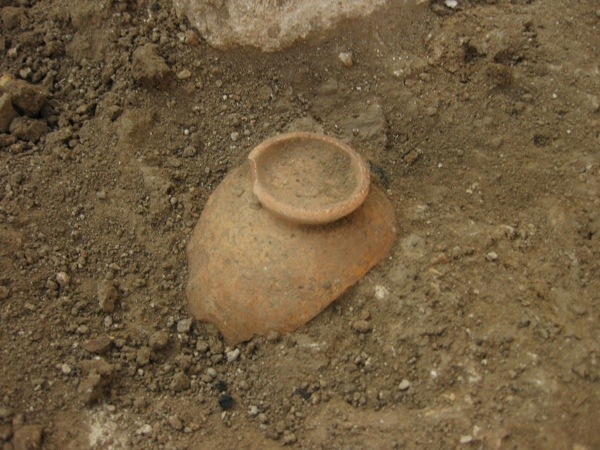 Thursday’s find: the bottom of a vessel. The sherd pictured above was found lying face down (base up), such that the first clue I found was a circular object and a small depression. I knew the sherd could not be too big (or completely intact) given that it was nestled next to a large rock. In the end, I thought this could have been a bigger chunk of pottery, but it still was probably my group’s most interesting find for the day. Fast forwarding to Friday, I found another interesting piece of pottery. This, pictured below, is the neck piece (not a scientific term) of a chalice, which is a stylized cup that is often used ceremonially or ritually. One would normally hold the chalice by this neck piece. I found it quite by accident–I didn’t see it immediately while I was digging with my pick, but when I was shoveling a mound of loose dirt into a bucket. Unfortunately, we have found no similar pieces that could allow us to reconstruct the chalice further. It was likely demolished, but this beefy piece survived the 4,000 years or so since the Middle Bronze Age. 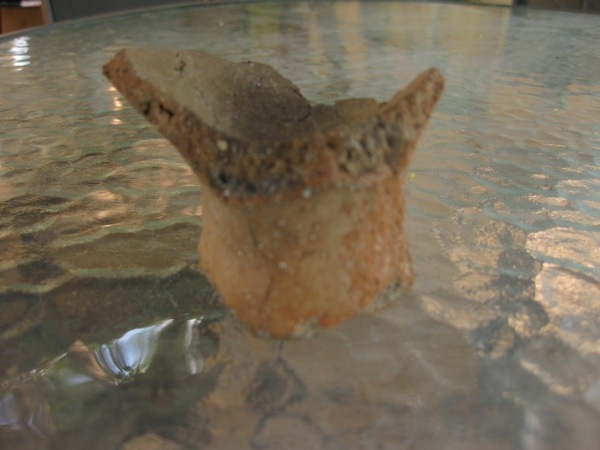 Friday’s find: the neck of a chalice. Thus ends the fifth day, and first week, of the dig. It was an exhausting (but exciting) week! The evening lectures began this week on Wednesday, with a general introduction to the excavations at Hazor led by Amnon Ben-Tor. Much of the information was a recap, given that I had read plenty of articles on my way over, but just like the tour he led of the site, it was enthralling to hear it from a source that has been present at Hazor since the late sixties. More interesting was the next evening’s introduction to pottery reading, where we learned how to determine if a given vessel is open or closed, and what general function it would have served (storage, cooking, food presentation, etc.). This weekend, I am traveling out of the kibbutz with a group of South Africans that has reserved a bus to several biblically significant sites. On Saturday, we will head north to Dan, Caesarea Philippi, Capernaum, and other places around the Sea of Galilee. I will definitely go with them on this trip, but I haven’t committed yet to Sunday, when the group is planning to take the same bus toward the western coast of Israel. Either way, I will surely have some great pictures from the weekend, and likely a blog post to accompany it. Until then, thanks for reading! Rob, how big of an area do you work on in a day, and how big of an area does the whole group work on in a day? The Saturday trip does sound interesting. Enjoy and look forward to those pictures. I left a note this a.m. but can’t see it anywhere. I’ll try again….Good Job finding some treasures. Enjoy your weekend adventures & safe travels while you are out & about! Any idea what the first jar was used for? Thanks for sharing? Why don’t you want to go to the west coast? Love you and be safe!! !